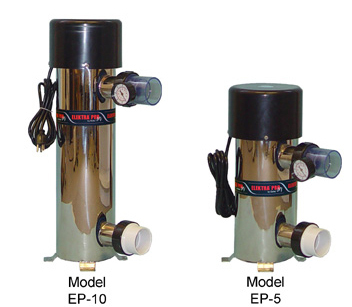 The Elektra Pro UV EP Series unit is a Ultraviolet Sanitizer and Clarifier designed specifically for the koi industry and are made of 100% stainless steel. The Elektra Pro UV EP Series models feature electronic ballasts in an easily removable plastic enclosure. An automatic on/off control is activated when water stops flowing in the chamber, which prevents overheating and solarizing of the quartz tube and lamp. Pond water containing unwanted contaminates enters the Elektra Pro UV EP Series unit's wet chamber and is exposed to the light rays generated by the UV bulb. The Elektra Pro UV EP Series unit has been designed to allow for some turbidity in the water, as turbidity will reduce the UV light wave transmission capability. Therefore, all Elektra Pro UV EP Series units are sized for a minimum two second exposure time to allow for possible turbidity in the water and the reduction in the killing power of the UV bulb when it nears the end of its useful life. When the incoming water is exposed for this duration, the water exiting the unit is near drinking water biological quality. Within the Elektra Pro UV EP Series Unit a high intensity electrically operated Ultraviolet (UV) bulb is located inside the unit’s wet chamber. This UV bulb gives off Ultraviolet light wave emissions when lit. The bulb’s operating emission range is within the Ultraviolet light wave spectrum at 253.7 nm of wavelength. This wavelength is such that when bacteria, protozoa, viruses, algae spores, or other single celled waterborne microorganisms in the incoming water flow are exposed to the light waves of the UV bulb for one second or more exposure time, the DNA of the microorganism is altered or disrupted, which controls and eradicates these unwanted contaminates and renders them harmless. Pond water containing unwanted contaminates enters the Delta UV EP Series unit's wet chamber and is exposed to the light rays generated by the UV bulb sat inside a Quartz Sleeve . The Delta UV EP Series unit has been designed to allow for some turbidity in the water, as turbidity will reduce the UV light wave transmission capability. Therefore, all Delta UV EP Series units are sized for a minimum two second exposure time to allow for possible turbidity in the water and the reduction in the killing power of the UV bulb when it nears the end of its useful life. When the incoming water is exposed for this duration, the water exiting the unit is near drinking water biological quality. Within the Delta UV EP Series Unit a high intensity electrically operated Ultraviolet (UV) bulb is located inside the unit’s wet chamber. This UV bulb gives off Ultraviolet light wave emissions when lit. The bulb’s operating emission range is within the Ultraviolet light wave spectrum at 253.7 nm of wavelength. This wavelength is such that when bacteria, protozoa, viruses, algae spores, or other single celled waterborne microorganisms in the incoming water flow are exposed to the light waves of the UV bulb for one second or more exposure time, the DNA of the microorganism is altered or disrupted, which controls and eradicates these unwanted contaminates and renders them harmless. The Delta UV EP Series models feature electronic ballasts in an easily removable metal enclosure, with on and fault indicator light. An automatic on/off control is activated when water stops flowing in the chamber, which prevents overheating and solarizing of the quartz tube and lamp. Pond water containing unwanted contaminates enters the Delta UV EP Series unit's wet chamber and is exposed to the light rays generated by the UV bulb. The Delta UV EP Series unit has been designed to allow for some turbidity in the water, as turbidity will reduce the UV light wave transmission capability. Therefore, all Delta UV EP Series units are sized for a minimum two second exposure time to allow for possible turbidity in the water and the reduction in the killing power of the UV bulb when it nears the end of its useful life.